Heading to the gym a little bit more often than usual? You should be! Summer is just around the corner and it’s a great time to get physically active. It is important to exercise regularly to stay in shape, but it is also important to eat a variety of healthy foods that will give you energy before and after a workout. Carbohydrates provide our bodies with energy, which help us get through a kickboxing class or outdoor run. Another important nutrient is protein. Protein helps to restore body tissue and build muscle, which we need especially after a vigorous exercise routine. Both will help you reach your exercise and weight loss goals! Hydrate. Drinking water is important to keep you well hydrated, whether you are doing mild or intense exercise. Drink an 8-ounce glass of water 10 minutes before exercise and continue to drink every 10 to 15 minutes during to replenish yourself. Rest. Don’t burn yourself out. Be sure to give yourself a day off and focus on yourself. Relax with a book or spend time with friends to let your body repair itself for the next workout. You will stay on track and be less stressed! Steer clear. Avoid sports drinks unless you’re doing more than 90 minutes of exercise, otherwise you may be adding on more calories than you burned off! Your best bet is to stick with water. Protein-packed drinks and meal bars are can also sabotage your weight loss goals. Too much protein can actually turn into fat, so use these products with caution. Toast sesame seeds in a 12-inch nonstick skillet over medium-high heat, stirring frequently, 1-minute or until golden. Remove sesame seeds and set aside. Season shrimp, if desired, with salt and black pepper. Melt Spread in same skillet over medium-high heat and cook shrimp, stirring frequently, 3-minutes or until shrimp turn pink. Arrange Spinach on serving platter. 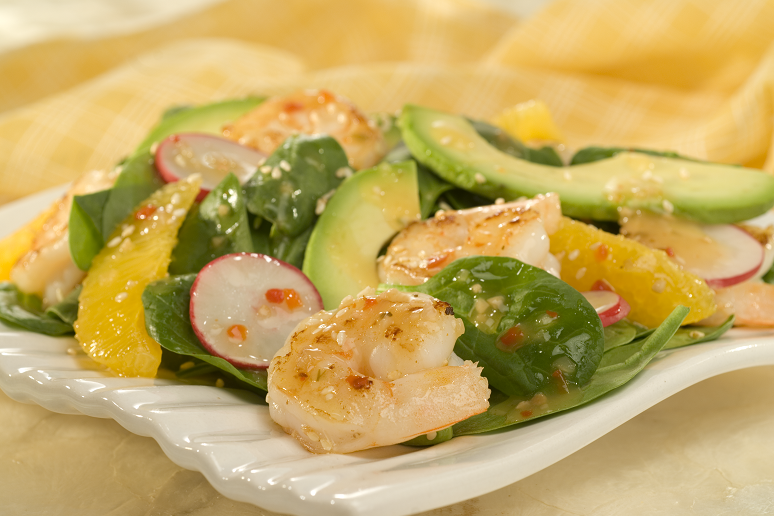 Top with avocado, orange, radishes and shrimp. Sprinkle with toasted sesame seeds. Just before serving, drizzle with Wish-Bone Light® Italian Dressing.